Anyway, I've been doing 3D game development for almost a year now, in Unity3D, which was a great piece of game making machine. I've also tried XNA, UDK, but non of them grab my heart long enough like Unity3D did. Now, for my internship program, I was tasked to developed a 2D game for the iPhone, iPad, and Android phone, with mechanics a bit similar to Doodle Jump without the jumping part. So, for the past few weeks I've been busy working on the game, in an area (or dimension) which I'm still kinda "fresh" at. I've never touched sprites all my life, not even in AS3... I mean... not like... a whole bunch of sprites in a piece of sprite sheets and then assign them one by one in correspond to a certain time, to make looks like it was animating. As far as I know, animating 2D sprites was a lot easier with SpriteManger, but that wasn't my primary choice for the project. I chose to load up a couple of 2D individual sprites and then animates them using a timer function, which, compare to SpriteManager, was a lot easier. But the downside with this method is that, it takes a LOOONG time to load up all of the textures. Imagine if I export it to iPhone, it would be a disaster length of time to load up those 400+ 2D individual sprites the artist prepared. 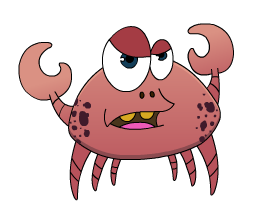 I have about 8 of this crabby image (which animates when you play them in Flash), instead of a piece of sprite sheet with 8 of them inside. From what I hear earlier, creating a Texture container and then drag and drop these textures into the container will results in increasing the loading time of the game. And that was before I realize that I could flip the texture of an image using Material.SetTextureScale(), I flipped all of the textures manually using Photoshop, and then load all of them using the method I use above and store them in two 3 dimensional arrays (the 3 dimension: level, enemy type, and textures). Just when I thought I finally found a solution to my long-loading problem, I realize that it was a waste of effort, because the game was only a bit less laggy than before by a bit. The problem occurs when I had to load the textures of 19 different enemy's 8 individual sprites, which has both left and right space, and adds up to a total of: 19 x 8 x 2 = 304 textures. It was a stupid move, I know, but during that time, the project was about close to deadline, and there's no time for me to go and learn something new, asides from trying other solution I could think of (other than SpriteManager, which was thought to be extremely hard to learn at that time).